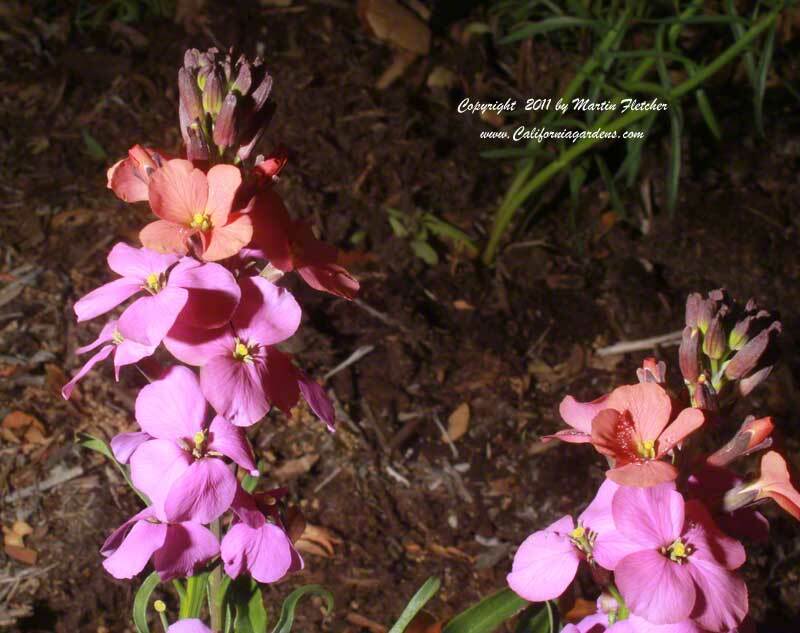 Erysimum Jenny Brook is a great choice when you want to mix all of the colors of the spectrum. The flowers fade from an orange salmon to purple as they age. The leaves are green and slender, the flowers held on stalks above the foliage. Erysimum Jenny Brook will last 2 seasons and maybe three. Often it should have been pulled out after the two but stays anyways with the misbegotten hope that it will recover. Erysimum Jenny Brook plants are compact and upright. The plants will look better if the flower stalks are removed once they get more than a foot long. Trimming off the older flowers encourages new ones. Erysimum Jenny Brook blooms spring through fall. Erysimum Jenny Brook is used best for a young garden or to give highlights to an older one. I think of using it much like an annual that lasts for a couple of seasons. The plant used to go under the genus name of Chieranthes. Flowers and foliage of Erysimum Jenny Brook - Perennial Wallflower. High resolution photos are part of our garden image collection.